Readings: Mic 7:14-15, 18-20; Lk 15:1-3, 11-32. 1/ First Reading: NAB Micah 7:14 Shepherd your people with your staff, the flock of your inheritance, That dwells apart in a woodland, in the midst of Carmel. Let them feed in Bashan and Gilead, as in the days of old; 15 as in the days when you came from the land of Egypt, show us wonderful signs. 16 The nations shall behold and be put to shame, in spite of all their strength; they shall put their hands over their mouths; their ears shall become deaf. 17 They shall lick the dust like the serpent, like reptiles on the ground; they shall come quaking from their fastnesses, trembling in fear of you (the LORD, our God). 18 Who is there like you, the God who removes guilt and pardons sin for the remnant of his inheritance; who does not persist in anger forever, but delights rather in clemency, 19 and will again have compassion on us, treading underfoot our guilt? You will cast into the depths of the sea all our sins; 20 you will show faithfulness to Jacob, and grace to Abraham, as you have sworn to our fathers from days of old. 2/ Gospel: NAB Luke 15:1 The tax collectors and sinners were all drawing near to listen to him, 2 but the Pharisees and scribes began to complain, saying, "This man welcomes sinners and eats with them." 3 So to them he addressed this parable. 11 Then he said, "A man had two sons, 12 and the younger son said to his father, 'Father, give me the share of your estate that should come to me.' So the father divided the property between them. 13 After a few days, the younger son collected all his belongings and set off to a distant country where he squandered his inheritance on a life of dissipation. 14 When he had freely spent everything, a severe famine struck that country, and he found himself in dire need. 15 So he hired himself out to one of the local citizens who sent him to his farm to tend the swine. 16 And he longed to eat his fill of the pods on which the swine fed, but nobody gave him any. 17 Coming to his senses he thought, 'How many of my father's hired workers have more than enough food to eat, but here am I, dying from hunger. 18 I shall get up and go to my father and I shall say to him, "Father, I have sinned against heaven and against you. 19 I no longer deserve to be called your son; treat me as you would treat one of your hired workers."' 20 So he got up and went back to his father. While he was still a long way off, his father caught sight of him, and was filled with compassion. He ran to his son, embraced him and kissed him. 21 His son said to him, 'Father, I have sinned against heaven and against you; I no longer deserve to be called your son.' 22 But his father ordered his servants, 'Quickly bring the finest robe and put it on him; put a ring on his finger and sandals on his feet. 23 Take the fattened calf and slaughter it. Then let us celebrate with a feast, 24 because this son of mine was dead, and has come to life again; he was lost, and has been found.' Then the celebration began. 25 Now the older son had been out in the field and, on his way back, as he neared the house, he heard the sound of music and dancing. 26 He called one of the servants and asked what this might mean. 27 The servant said to him, 'Your brother has returned and your father has slaughtered the fattened calf because he has him back safe and sound.' 28 He became angry, and when he refused to enter the house, his father came out and pleaded with him. 29 He said to his father in reply, 'Look, all these years I served you and not once did I disobey your orders; yet you never gave me even a young goat to feast on with my friends. 30 But when your son returns who swallowed up your property with prostitutes, for him you slaughter the fattened calf.' 31 He said to him, 'My son, you are here with me always; everything I have is yours. 32 But now we must celebrate and rejoice, because your brother was dead and has come to life again; he was lost and has been found.'" When people hear Jesus’ teaching about to forgive one’s enemies and to pray for those who persecuted us, many people shook their head and complained: It is impossible! How can it be achieved? One thing people need to know that God never demands human beings to do the impossible thing. To help people to do what He demands, He gives them grace and invites them to reflect on their relationship with Him. Today readings help people to recognize that God’s love and forgiveness are greater than human sins which they committed against Him. In the first reading, the prophet Micah asked God to reconnect His relationship with the Israelites after the Exile. Only God can do this because all the Israelites sinned against Him. To achieve that, God must tread underfoot the Israelites’ guilt and cast into the depths of the sea all their sins. In the Gospel, St. Luke presented to us a deep meaning story about God’s loving forgiveness. He is always ready to forgive and to recover the rights of sinners when they repented. 2.1/ Sinners need God’s forgiveness: St. Luke arranged the story in the context of a bigger picture and an important message: All people are sinners and therefore, they need God’s loving forgiveness. He opened the story with human reaction: “The tax collectors and sinners were all drawing near to listen to him, but the Pharisees and scribes began to complain, saying, "This man welcomes sinners and eats with them." So to them he addressed this parable.” Chapter 15 had three stories of “lost and found” stories, but the last one is long, deep and most beautiful than other two stories because it included the whole process from sinning, repenting, returning and receiving God’s forgiveness. (1) Sin and freedom: Sin happens when one misuses his freedom. God bestows on people freedom and He respects their freedom to choose. God, of course, can make people to obey Him; but if He does that, He is contradictory with Himself, and people don’t feel comfortable when they must do that. The young son showed us an example of misusing freedom by asking his father to give him his portion and to leave his father’s house. The father let his young son have complete freedom though he was suffering. He knew this might be his last chance to see his son. (2) Sin and punishment: When one chooses the way, he also chooses the result of that way. The one who knows how to properly use his freedom, must learn in advance all possible results that can happen and choose the way that brings good results. The young son didn’t foresee bad results of his decision. When the bad results occurred, he knew that he made a wrong decision. Since he had no skill for a decent job, he must take care of pigs, a lowly and insulted job by the Israelites. Not only that, he wished to eat what the pigs were eating because he was so hungry; but no one gave that to him. His dignity was lower than the impure animals. (3) Sin and repentance: Suffering and pain are necessary for people to know right from wrong. In moments of suffering, people recognize the need of repentance. The young son recognized he didn’t live according to a son’s duty. He wanted to ask his father to treat him as a servant so he could have food to eat. He determined to stand up and to return. 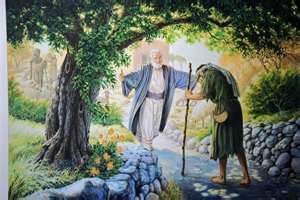 (4) Sin and forgiveness: There is a small detail in the story, but many people noticed that why did the father know when his young son coming back so that he can welcome him? Some stipulated that he must come out of his house everyday with a hope that he might see him coming back. The more reasonable argument is probably because Jesus wanted to imply God the Father; only God knows what is happening in human mind. He is ready to unconditionally forgive and didn’t let the young son to finish his talking. He doesn’t only forgive but also recovered all of his rights through clothing him with the most beautiful dress, putting a golden ring in his finger and a pair of shoes in his feet, and ordering to have a welcome back party. 2.2/ People can’t fathom God’s love: The father’s immense love and unconditional forgiveness made many people uncomfortable, especially the older son. - It is difficult for us to forgive our enemies and to pray for our persecutors because we didn’t examine our conscience to recognize of God’s forgiveness for us. - Once we recognized God’s forgiveness and His love for us, we shall easily forgive for our brothers and sisters. We shall also recognize that their sins against us sometimes can’t be compared with our sins against God. - Finally, all that matter is love. If we received love from God, we must also share this love for one another.